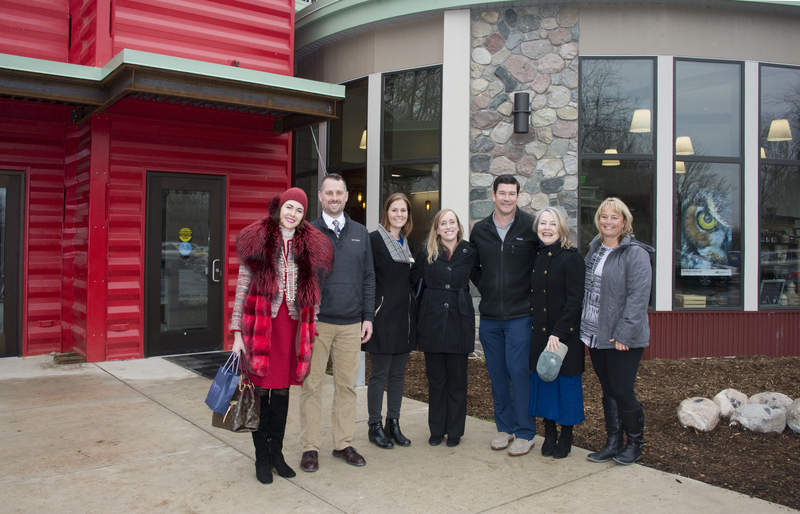 *Pictured above from the left, Laura Wege, Blandford Nature Center President Jason Meyer, Blandford Development Director Corey Turner, Wege Foundation staff member Katy Furtado, Patrick Goodwillie, Diana Wege, Wege Foundation staff member Jody Price at the Nature Center’s new visitors center named for Blandford’s founder Mary Jane Dockeray. 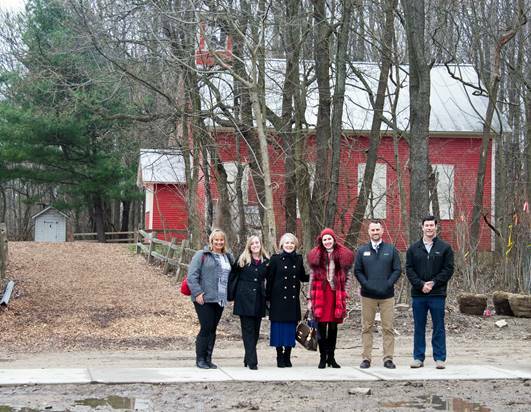 In April 2017, Patrick Goodwillie, Diana Wege, and Laura Wege, three members of the Wege family, and Jody Price and Katy Furtado, Wege Foundation staff members toured Blandford Nature Center. They were among the first to visit the new the Mary Jane Dockeray Visitor Center named for the Nature Center’s founder. And they saw the original visitor’s building renamed for their father and grandfather. This partnership between Blandford and The Wege Foundation began in 2009 when the 143-acre Nature Center lost Kent County support and became a 501 C-3 non-profit funded by private donations. The first giver when the taxpayers could no longer keep it going was The Wege Foundation. Peter Wege made a five-year commitment to fund Blandford from 2009 until 2014. Blandford’s President/CEO Jason Meyer summarized the significance of that first gift. “Simply put, Blandford Nature Center may not even exist today had The Wege Foundation not stepped in to support us through our transition to nonprofit management. Jody Price, Katy Furtado, Diana Wege, Laura Wege, Jason Meyer, and Patrick Goodwillie on the nature trail at Blandford Nature Center. The Wege family also celebrated The Wege Foundation’s role in the recent real-estate transaction that doubled the Nature Center’s property when the Land Conservancy of West Michigan took over the 121-acre former Highlands Golf Course adjacent to the Center. The Wege Foundation, the Grand Rapids Community Foundation, the Ken and Judy Betz family, and the Cook Foundation made the lead gifts to buy the property. Adding the former golf course’s 121 acres to Blandford’s gives the Nature Center 264 acres of permanently preserved green space inside the city limits open to the public. Consistent with The Wege Foundation’s original environmental focus, instead of the proposed development of the century-old golf course into homes and condos, the land is being converted back to its natural state rich with wetlands and wildlife habitats. Previous Previous post: Wege Prize competition organizers are thrilled to announce the finalist teams for Wege Prize 2017!